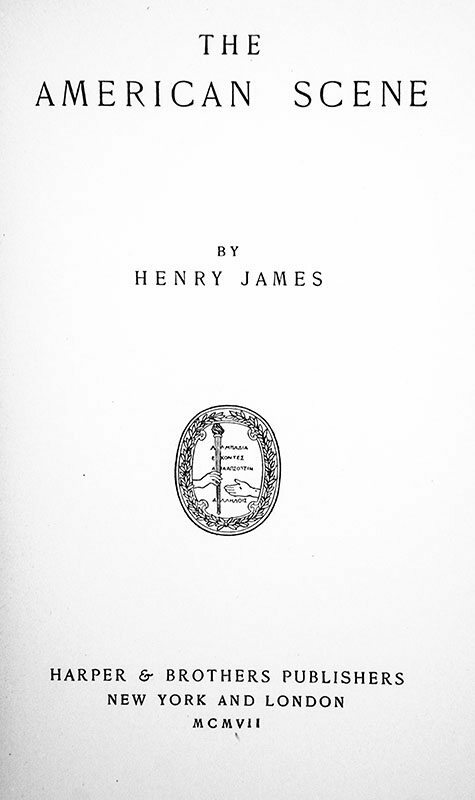 First American edition of James’ account of his trip throughout the United States between 1904 and 1905. Original blue cloth, gilt tooling to the front panel and spine. In very good condition. A nice example. 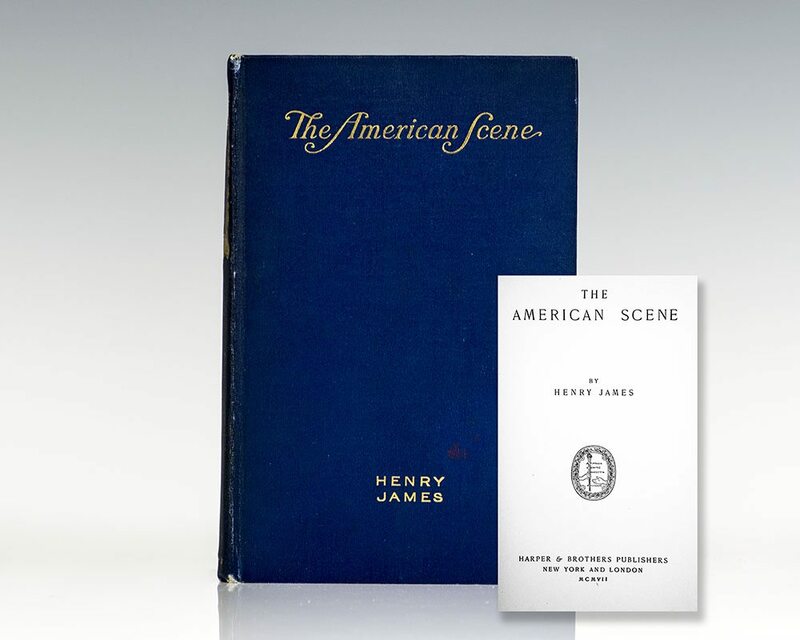 The American Scene is undoubtedly the most controversial and critically discussed of James' travel books for its sharp attack on what James saw as the rampant materialism and frayed social structure of turn-of-the-century America. Covering James' travels throughout the country, the book still has relevance to a number topics which affect the current sociopolitical environment including immigration policy, environmental protection, economic growth, and racial tensions. Boston: James R. Osgood and Company, 1885. First edition of this collection of James novellas. Octavo, original green cloth, gilt titles to the spine. In very good condition. A nice example. First edition of this parable of how people shape appearances into an explanation of an impossibly complex world. Octavo, original cloth, gilt titles to the spine, front panel. Contemporary bookplate, in near fine condition with light toning. Notes of a Son and Brother. New York: Charles Scribner's Sons, 1914. 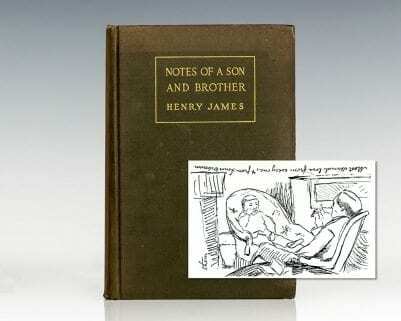 First edition of James’ autobiography, in which he writes about his childhood and his family. Octavo, original cloth, gilt topstain, frontispiece, tissue guard. In good condition. New York and London : Harper & Brothers Publishers, 1899. 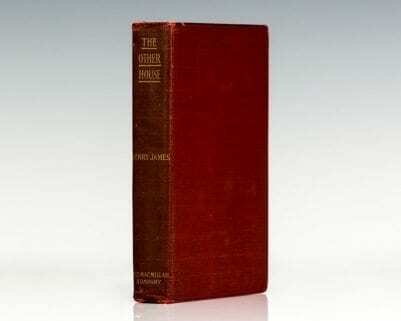 First edition of James’ classic novel of a girl coming of age in high English society at the turn of the 20th century. Octavo, original cloth, gilt titles to the spine and front panel. In very good condition. New York: The Macmillan Company, 1900. 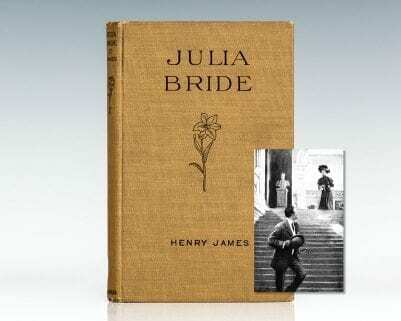 First edition of this collection of James’ novellas. Octavo, original cloth, gilt titles to the spine. In very good condition. London: Methuen & Co, 1901. First edition of James’ haunting mystery novel. Octavo, original crimson cloth with gilt titles and tooling to the spine and front panel. In good condition. New York and London: Macmillan & Co, 1893. 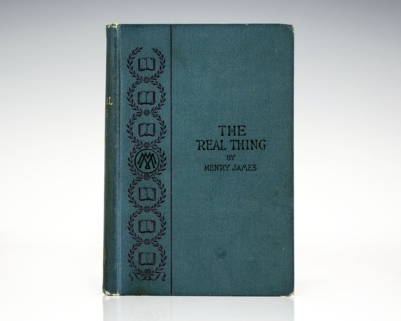 First edition, second issue of one of James’ neatest tales. Octavo, original cloth. In near fine condition with light rubbing to the extremities, small tear to the front free endpaper. New York: Macmillan and Co, 1886. First edition of this early novel in the extensive James canon. Octavo, original blue cloth, gilt titles and tooling to the spine. In very good condition. New York: Charles Scribner's Sons, 1904. First edition of this classic James novel. Octavo, original cloth, gilt titles to the spine, gilt topstain. In very good condition with light rubbing and wear. A nice example. New York: Boni and Liveright, 1919. 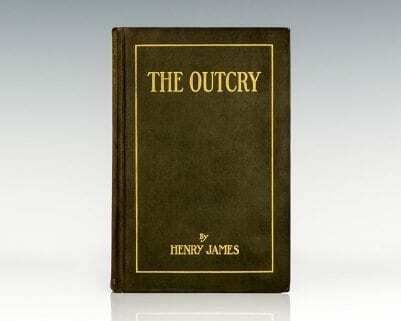 First edition of this collection of James’ short stories. Octavo, original cloth. 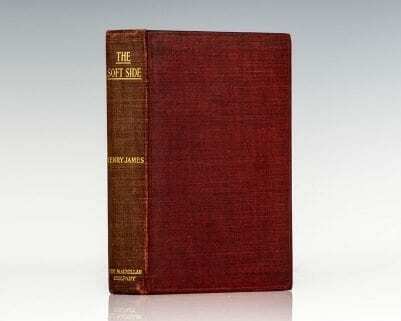 Near fine in the scarce original first issue dust jacket with the $1.75 spine price which is in very good condition. 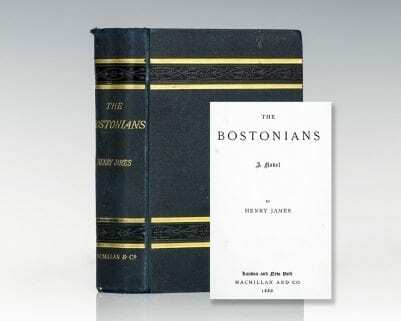 Boston: Houghton, Mifflin and Company, 1881. 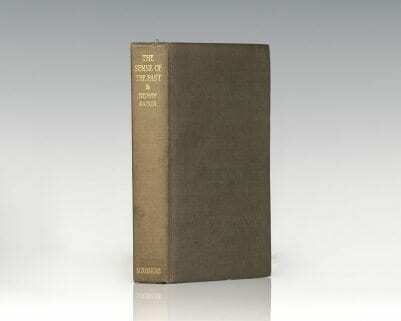 First edition of the last and most accomplished work of fiction during James’ apprentice years. Octavo, original cloth. First edition, first issue with 1882 on title page and “1881.” on copyright page. In near fine condition with light rubbing. A very nice example. 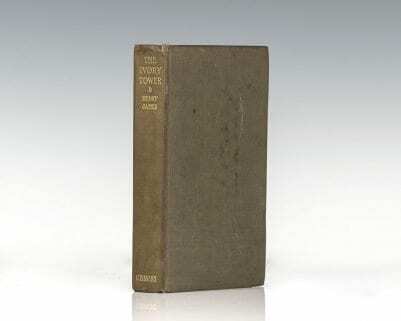 Within the Rim and other Essays, 1914-15. London: W. Collins Sons & Co. Ltd, 1918. First edition of this collection of essays. Octavo, original cloth, gilt titles to the spine and front panel. In very good condition. BAL 10702. Views and Reviews: Now First Collected. Boston: The Ball Publishing Company, 1908. 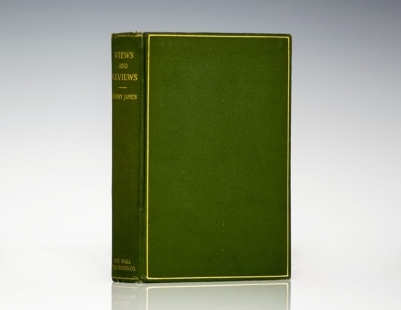 First edition of this series of literary essays written in James’ earlier style. Octavo, original cloth, gilt titles to the spine, gilt topstain. Introduction by Le Roy Phillips. In near fine condition. A very bright example. Boston: James R. Osgood, 1884. 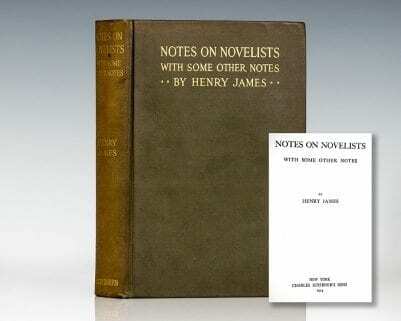 First edition of this collection of James novellas. Octavo, original cloth, gilt titles and tooling to the spine. In very good condition with light rubbing to the crown and foot of the spine. English Men of Letters: Hawthorne. London: Macmillan an Co, 1879. 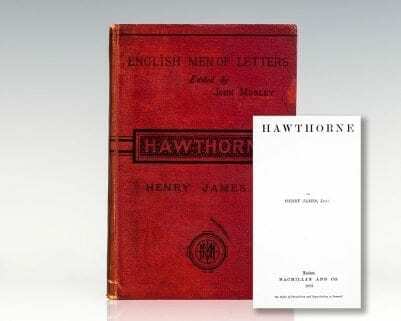 First British edition of James’ classic biographical study of his great predecessor Nathaniel Hawthorne. Octavo, original scarlet cloth. In very good condition with light rubbing. Edited by John Morley. The Last of the Valerii. 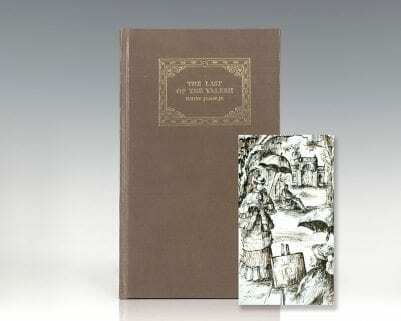 Limited Artists’ Book edition of Henry James’ The Last of the Valerii. Number 46 of one hundred numbered copies printed on Wookey Hole handmade paper by John Baskett in 16 point Blado italic font, the same font used in the original publication in The Atlantic Monthly for January 1874. Frontispiece by Julia Trevelyan Oman. Octavo, gilt title and tooling spine and front panel. In fine condition. London: Westminster and Archibald Constable & Co, 1902. 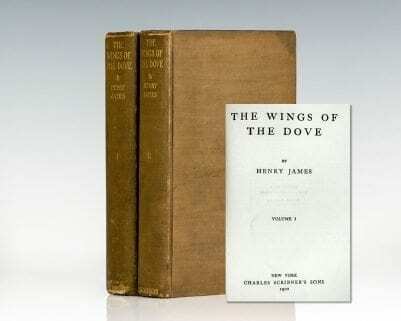 First edition of Henry James’ landmark novel. Octavo, original cloth. In very good condition with some light rubbing to the spine. London and New York: Macmillan and Co, 1888. First edition of James’ book of collected essays of literary criticism. Octavo, original cloth, gilt title to the spine. In good condition. New York & London: Harper & Brothers Publishers, 1909. 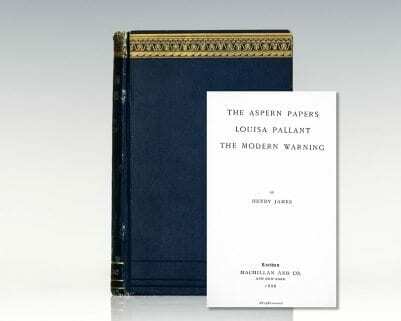 First American edition of this short work by James. 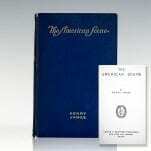 Octavo, original cloth, frontispiece, tissue guard. In near fine condition. New York: The Macmillan Company, 1896. 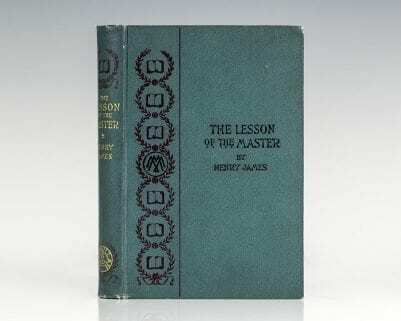 First American edition of this terse and startling novel, written just before The Spoils of Poynton and What Maisie Knew, is the story of a struggle for possession—and of its devastating consequences.. Octavo, original cloth. In very good condition. 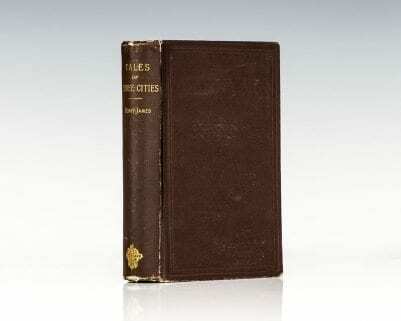 London and New York: Macmillan and Company, 1886. 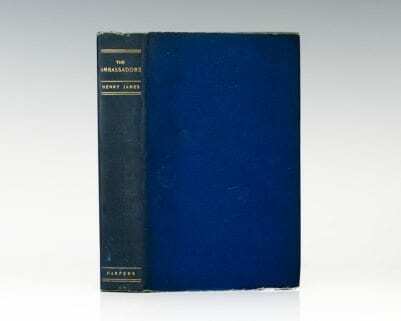 First single volume edition of James’ classic tragicomedy. Octavo, original cloth. In near fine condition with light rubbing to the crown of the spine. New York : Harper & Brothers, 1903. 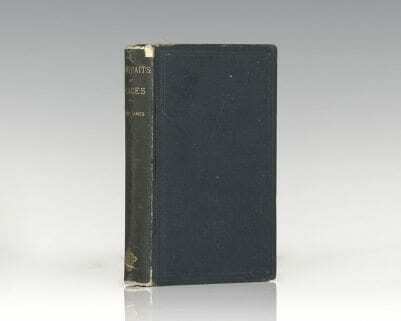 First American edition of this dark comedy, which Henry James considered his finest work. Octavo, original cloth, gilt topstain. Fine in a near fine dust jacket with light toning to the spine. A nice example. Notes on Novelists with Some Other Notes. 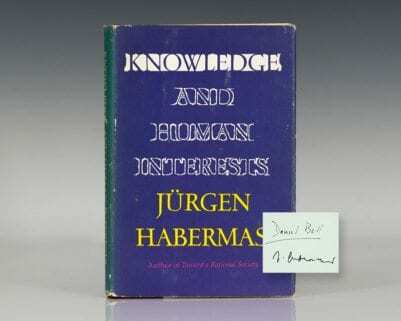 First edition of James’ collection of essays of literary criticism spanning the course of two decades. Octavo, original cloth, gilt titles to the spine and front panel. In very good condition. Boston: James R. Osgood and Company, 1884. 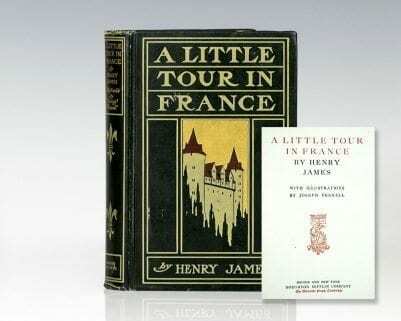 First edition of James’ later collection of travel accounts throughout Europe and the United States. Octavo, original cloth, gilt titles to the spine. In very good condition. 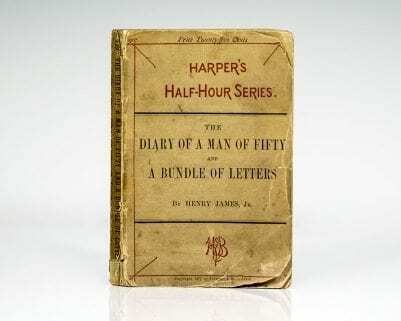 The Diary of a Man of Fifty and A Bundle of Letters. New York: Harpers & Brothers, Publishers, 1880. First Harper’s Half-Hour Series edition of this duo of James novellas. 12mo, original wrappers as issued. In good condition. New York: Thomas Seltzer, 1920. First edition of this short story by James. Octavo, original cloth. In near fine condition. 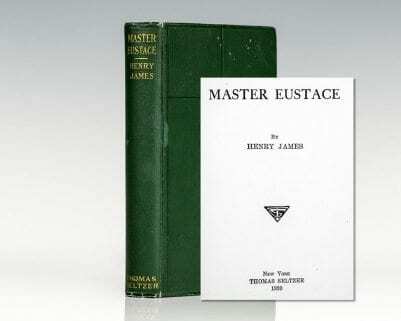 First American edition, second issue of this dark comedy, which Henry James considered his finest work. Octavo, original cloth, gilt topstain. 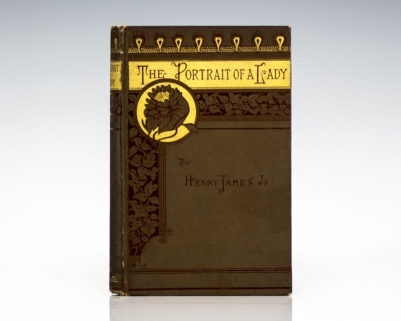 Presentation copy, lengthily inscribed by Henry James with a quotation from the novel in James’ hand on a Bryn Mawr book label, “Henry James November 30th 1905 ‘….a fine worn handsome face, a face that was like an open letter in a foreign tongue’ The Ambassadors.” James visited America in 1904-05, where he addressed Bryn Mawr twice. It is possible James was asked to donate a copy of one of his books for the Bryn Mawr Christmas bookfair to raise funds for the college. 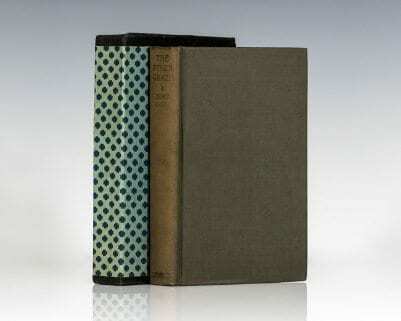 Near fine in a very good dust jacket with light rubbing to the extremities. Housed in a custom half morocco clamshell box. A unique example. Boston: Houghton Mifflin and Company, 1899. 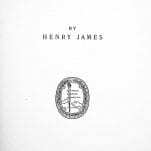 First edition of the of James’ stage presentation of his classic work. Octavo, original cloth. 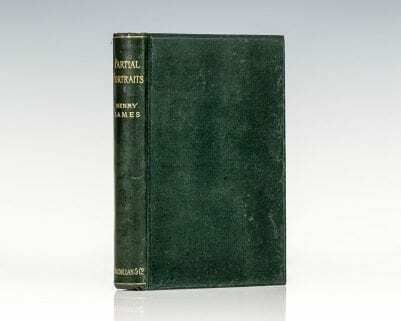 Presentation copy, inscribed by the author on the front free endpaper, “For an unknown friend Henry James March 8th 1905.” In near fine condition with light rubbing. This example was signed by James on his American tour in 1905. Housed in a custom cloth clamshell box. Rare and desirable signed. The Sense of the Past. New York: Charles Scribner's Sons, 1917. 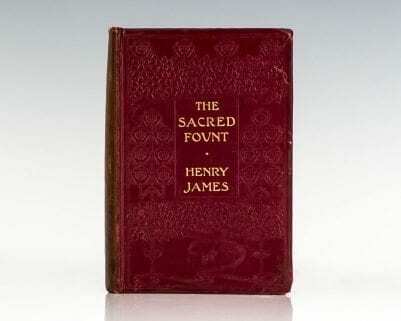 First American edition of one of James’ two unfinished novels, published posthumously. Octavo, original cloth, gilt titles to the spine, in near fine condition. 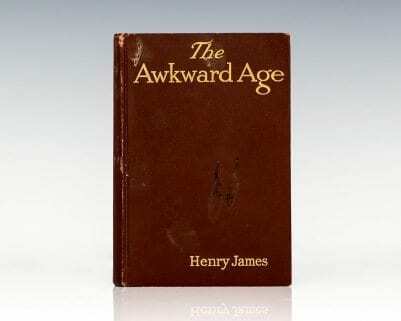 First edition of Henry James’ landmark novel. Octavo, original cloth. In near fine condition with the spine gilt still bright, light foxing, bookplates. Uncommon in this condition. Boston: James R. Osgood & Co, 1875. 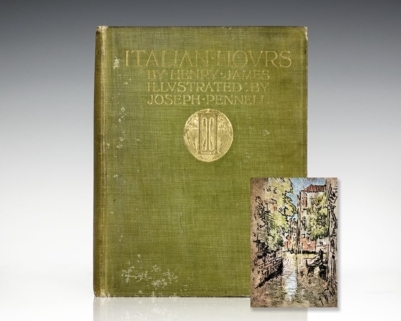 First edition of James’ autobiographical collection of travel pieces. Octavo, original cloth, gilt titles and tooling to the spine. In good condition. A nice example of this important work. 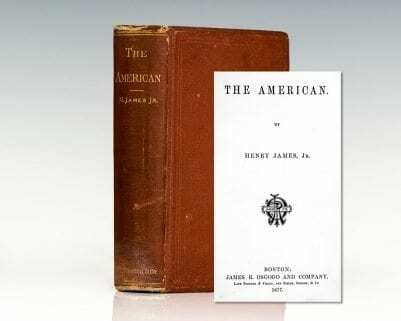 First American edition of this later collection of James novellas. Octavo, original cloth, gilt titles and elaborate tooling to the spine. In very good condition. 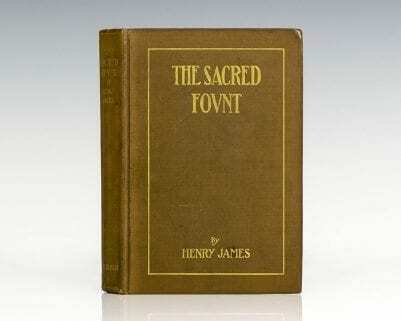 First American edition of James’ unfinished novel, published posthumously in 1917. Octavo, original cloth, gilt titles to the spine. In near fine condition. Essays in London and Elsewhere. New York: Harper & Brothers Publishers, 1893. 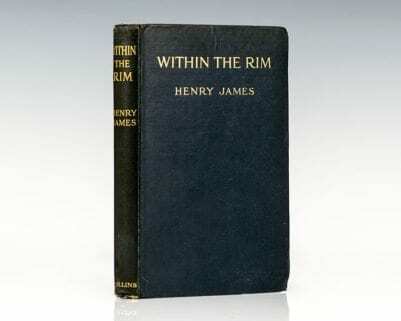 First edition of this book of criticism by Henry James. Octavo, original cloth. In near fine condition with a touch of wear. A very bright example. 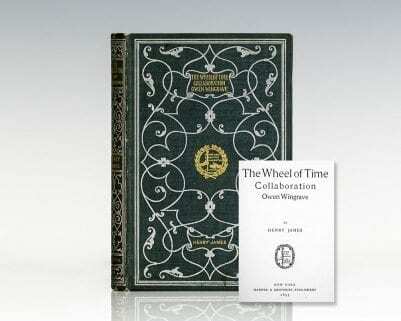 The Wheel of Time, Collaboration, and Owen Wingrave. New York : Harper & Brothers Publishers, 1893. First edition of this early collection of novellas. Octavo, original illustrated cloth with elaborate gilt tooling to the spine and front panel. In near fine condition. An exceptional example. 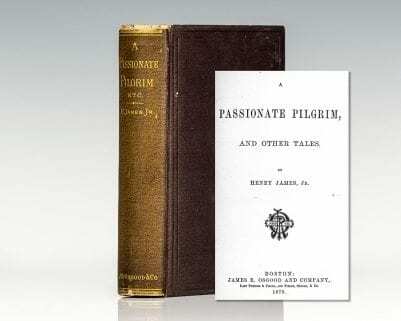 A Passionate Pilgrim and Other Tales. Boston : James R. Osgood and Company, 1875. 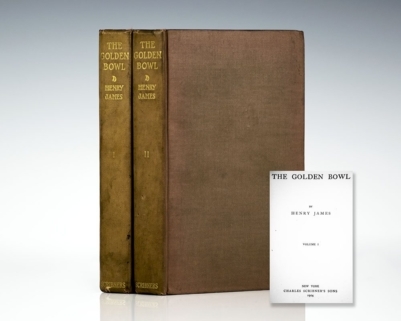 First edition, first state binding, with “J.R. 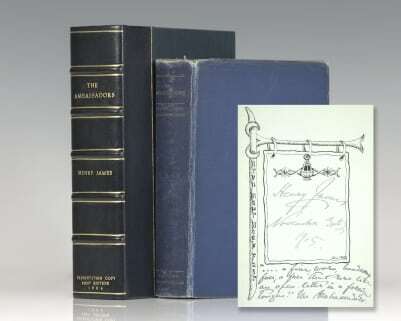 Osgood & Co.” on the spine of Henry James’ first book. Octavo, original cloth. In excellent condition with light rubbing and wear. Boston: James R. Osgood and Company, 1877. First edition of this masterly early work by James. Octavo, original cloth. In very good condition with light rubbing and wear. New York: Charles Scribner's Sons, 1902. 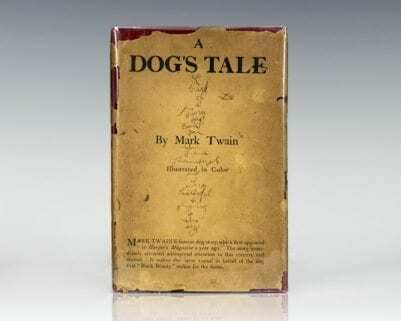 First American edition, and true first, preceding the English edition of James’ classic novel. Octavo, original cloth, two volumes, gilt topstain. In very good condition. 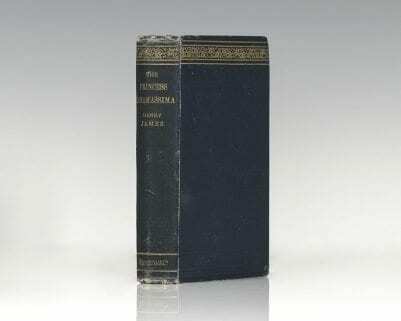 London: Macmillan and Co, 1888. 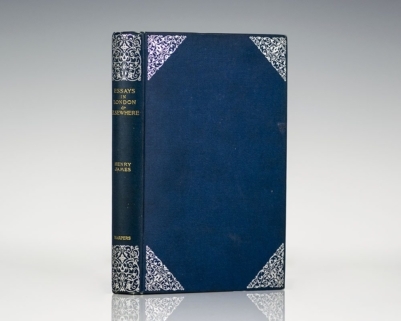 First edition of one of James’ best-known longer novellas, based on the letters from Percy Bysshe Shelley to his second wife Mary Shelley’s stepsister Claire Clairmont, whom he was known to have had several affairs with. Octavo, original illustrated cloth, gilt titles and tooling to the spine. In very good condition with light rubbing and wear to the spine. William Wetmore Story and His Friends. Boston: Houghton, Mifflin & Co, 1903. 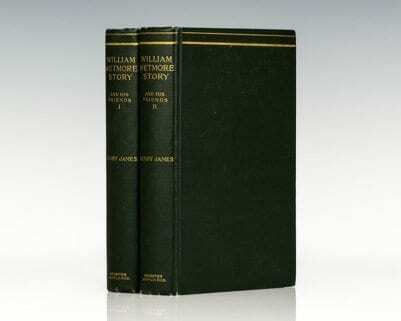 First editions of James’ entertaining account of Story’s life in Rome” (Encyclopedia Brittanica). 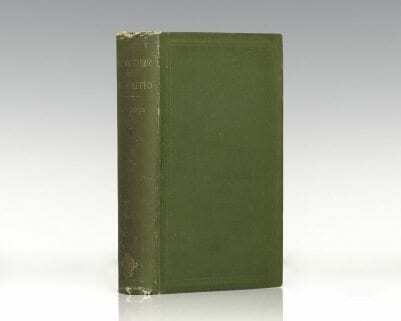 Octavo, original gilt-stamped green cloth, top edges gilt, photogravure frontispiece. In near fine condition, small contemporary bookplates to the front pastedown. BAL 10655. A Small Boy and Others. London: Macmillan & Co., Limited, 1913. 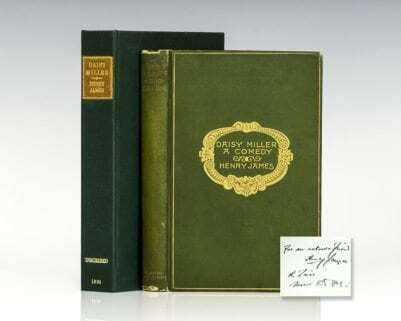 First edition of the first volume of Henry James’ autobiography. Octavo, original cloth, frontispiece, tissue guard. 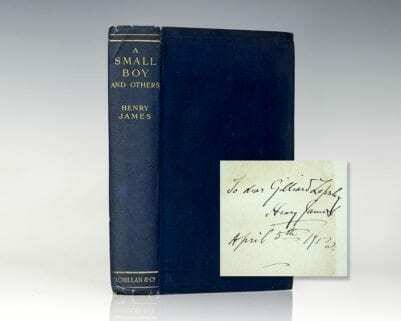 Inscribed by the author on the front free endpaper in the year of publication, “To dear Gilliard Lapsley Henry James April 5th 1913.” The recipient, Gilliard Lapsley was a young historian with whom James became friends (Leon Edel, Letters p. 28). Bookplate, near fine condition with light rubbing. Rare and desirable signed and inscribed by James. The Lesson of the Master. New York and London: Macmillan & Co, 1892. First edition of this novella, which tells the story of a young writer, Paul Overt, who meets Henry St. George, a famous novelist Overt admires. Octavo, original cloth, gilt titles to the spine. In near fine condition, contemporary name to the title page. A very sharp example with the spine gilt fresh. First British edition of this book of travel writing, wonderfully illustrated by Joseph Pennell. Quarto, original cloth, gilt pictorial stamped to the front panel, gilt titles to the spine, top edge gilt. Illustrated by Joseph Pennell with 32 color plates, with tissue guards. In very good condition with light rubbing to the extremities. New York: Charles Scribner's Sons, 1911. 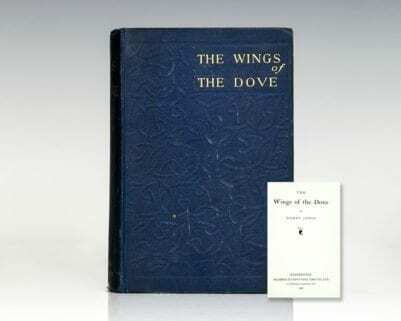 First American edition, published simultaneously with the British edition of James’ final novel. Octavo, original cloth. In near fine condition, bookplate. A very sharp example.